Discussion in 'WWII Today' started by PzJgr, Jun 4, 2018. I have seen this aircraft in a movie (can't remember which one) and noted that it was a two seater of what I thought was a Buchon. Now I know. For sale by Platinum Fighter Sales -1954 Hispano Aviation HA-1112-M4L. 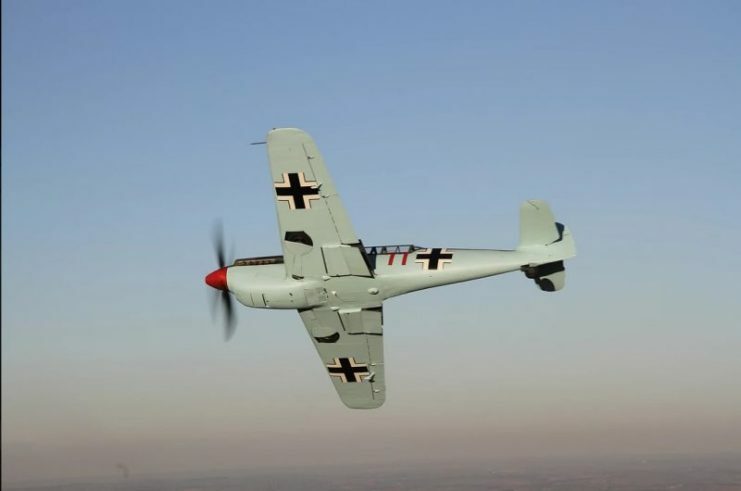 History: Based on the G-2 variant of Messerschmitt’s legendary Bf-109 fighter, Hispano Aviation’s HA-1112 is considered by many to be the ultimate development of the Bf-109 family when post-war variants are taken into account. What began in 1944 as Spain’s attempt to salvage a serviceable aircraft for themselves from a failed arrangement with Germany, reached it’s peak in 1952 with the first flight of the HA-1112. The aircraft would serve the Spanish Air Force until 1965 and become a popular substitute for its Bf-109 sibling in films and airshows. Although 233 single seat fighters were built, only two dual-control two seat trainers were built. The first was powered by the Hispano-Suiza 12Z and designated HA-1110-K1L. The second two seater was built with a Merlin 500 engine and designated HA-1112-M4L. The HA-1110-K1L was eventually converted to an HA-1112-M4L. The subject aircraft G-AWHC is the original and only genuine HA-1112-M4L dual-control two seater in existence, making it one of the rarest warbirds available in the market place today. A number of Buchóns were deployed to Spanish Sahara (1957-58) to battle Moroccan insurgents and their allies. The Buchóns were primarily tasked with giving close air support to army units on the ground. During the battle, the HA-1112 earned the distinction of being the last member of the Bf-109 family to participate in actual battle. “Der Stern von Afrika” (The Star of Africa) A German film from 1957 focusing on the Luftwaffe ace, Hans-Joachim Marseille. “Battle of Britain” The legendary British film from 1968 features many Buchóns (including this example) filling the Bf-109 role. “Memphis Belle” The 1990 American film about the Boeing B-17 bomber of the same name. “The Tuskegee Airmen” A 1995 American film about the famous fighter group of all African American pilots in WWII. “Dark Blue World” A Czech film from 2001 about Czechoslovakian pilots in the RAF during WWII. During 1968, ‘Connie’ Edwards and additional members of the Confederate Air Force (as it was known then) visited Europe to purchase surplus military aircraft (Warbirds), including HA-1112 Buchons and Spitfires. Having done so, they were approached by Hamish Mahaddie – aircraft procurement officer for Spitfire Productions during the making of the iconic 1968 classic film, Battle of Britain. Edwards and company agreed to lease the aircraft to Mahaddie on the basis that they would fly the aircraft in the movie. As Connie tells it, “Well, three months became 11 months and I ended up Chief Stunt Pilot. During that 11 months, I flew everything including Spitfires, Hurricanes, 109s, Heinkels and even the B-25 photo ship. We also drank plenty of beer and I became good friends with Adolf Galland and ‘Ginger’ Lacey. At the end of filming they owed me $80,000 and couldn’t pay and wanted to give me an I.O.U. I said, Screw that noise! I’ll take those 16 Messerschmitts (Buchons) as payment! 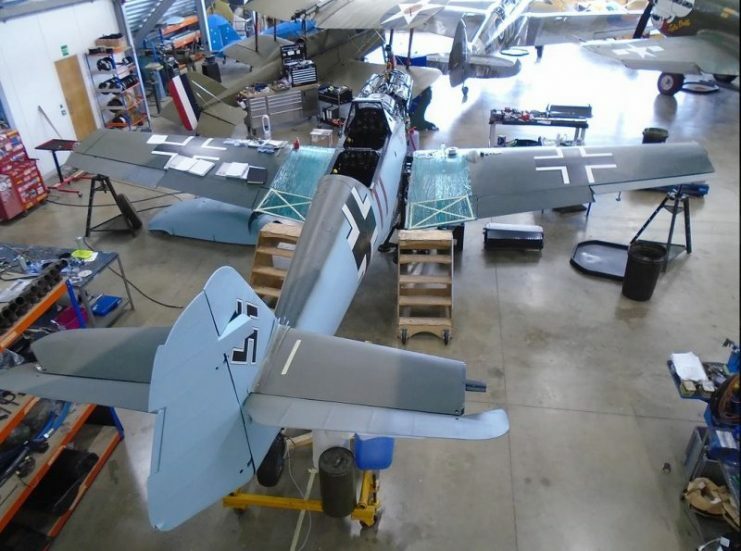 After they agreed, the production company realised they needed two Messerschmitts for an upcoming movie, so I traded them two Messerschmitts (Buchons) for my favourite Spitfire IX MH415 and shipped em all home to the Ranch in West Texas.” There the last of the HA-1112s and Spitfire sat for over 45 years in a hangar in the dry West Texas climate – unmoved, unmolested, still in their movie paint and unrestored! During the filming of the 1968 Battle of Britain movie, Luftwaffe and British Aces Adolf Galland and Robert Stanford-Tuck were employed as technical advisors. During this period, they both flew HA-1112-M4L G-AWHC during a break in filming. (See b/w photos on this page) The old adversaries, who fought each other during the 1940 Battle of Britain had become close friends and hunted Game together with Tuck serving as godfather to Galland’s son Andreas. A genuine ‘Barn Find’ with continuing history since the day it left the factory! In 2014, ‘Connie’ Edwards engaged Platinum Fighter Sales to market and sell his remaining Messerschmitts (Buchons). Within 24 hours Platinum had the first offer and the majority of the Buchons were purchased by a Swiss Company. The balance of aircraft including the world’s only HA-1112-M4L, G-AWHC going to an Australian Collector. 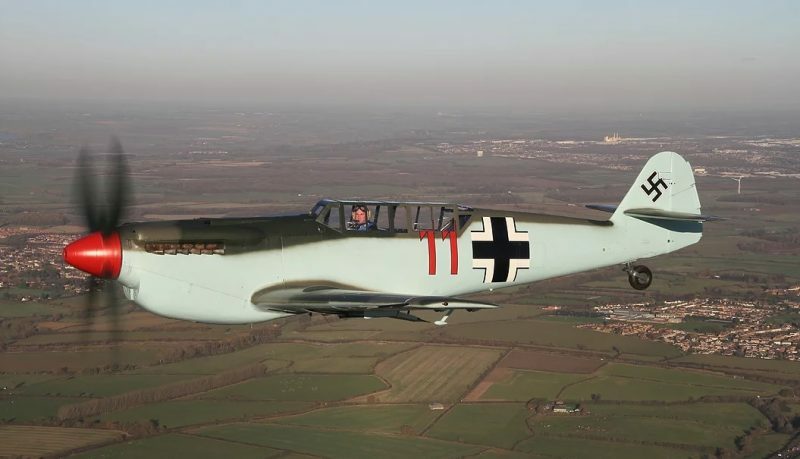 Given G-AWHC’s rare factory two seat configuration, Battle of Britain movie history, being flown by such legends as Adolf Galland and Robert Stanford-Tuck, it makes the aircraft very attractive from an investment point of view. In addition, G-AWHC has enormous potential as a revenue earner providing passenger flights to history and movie buffs alike (subject to authority approval). 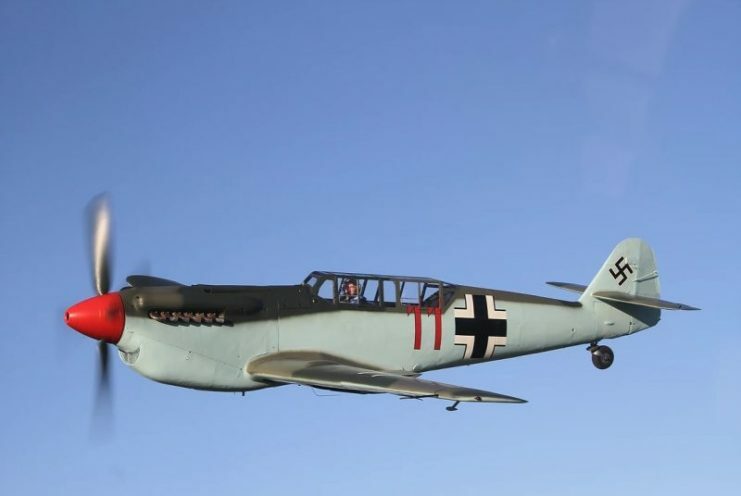 How many flying true ME 109's are in existence? 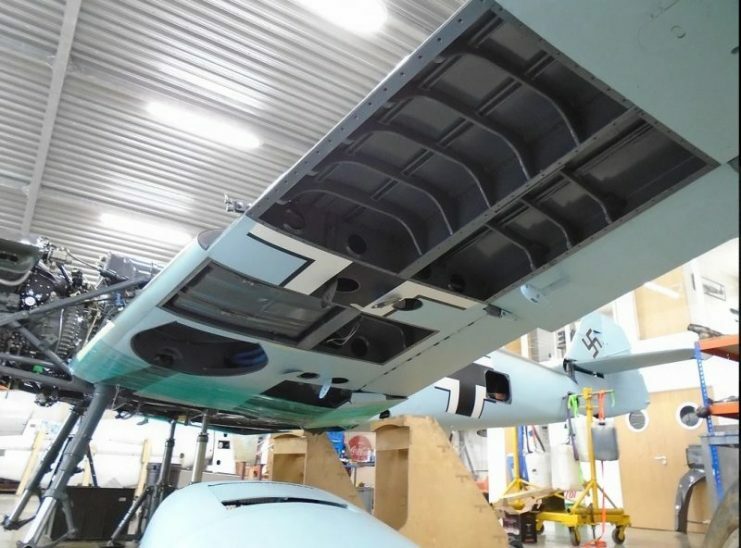 With an MB 600-603 engine? Just curious as I think very very few. A Ferrari 250 GTO from the early 60's sold this week for a reputed $70,000,000 so less than 10% of that seems reasonable but collectors are funny about authenticity.. A HA 1112 with a Merlin might not be that desirable if a Me 109 is available. The inverted MB engine is a big clue ! There is a MB 600 series engine with 20MM cannon mounted at the Kbely Aircraft Museum, outside of Prague, on display sitting on the floor. Bet someone would like it. There is also a 109 or a 1112, cannot remember which in a static display. Their ME 262 is a post-war Czech version..
thanks, JJ, that sounds about right. Hard to believe over 20,000 were made and many even after the war. I have never seen one fly but have seen a number in static displays. 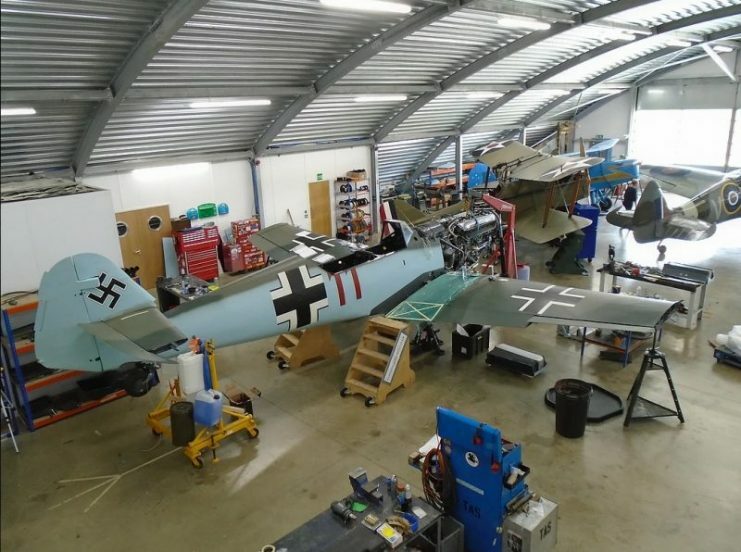 The Kbely Museum, now rearranged, but once had a P-40. P-47, P51D, Spitfire, Hurricane, Yak-9 and a 109 all grouped together and the p-47 looked like a giant ! Hard to believe they were all fighters compared to it. The Spitfire was the most beautiful to my eye but I also liked the functional look of the 109, 100% war machine. not even aerodynamic looking but pure purposefulness. Thank you for those great photographs above ! Among the other hundreds of aircraft I've seen fly, the BF-109 unfortunately isn't on my list either Gaines. When I look at Warbirds, I don't just see the planes, I see that they have personalities, and the BF-109 strikes me as quietly confident, strong, and free spirited, that might sound crazy but that's how I see it! 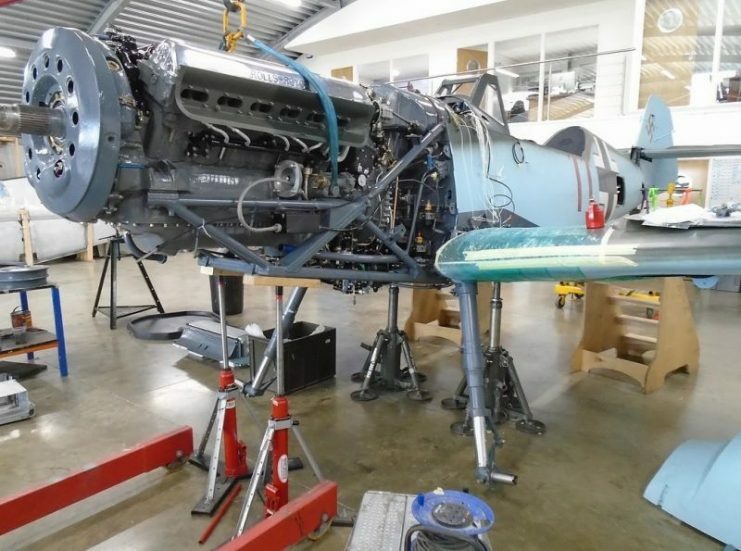 I've watched countless hours of youtube videos of the original BF-109's and the engine sound is fantastic, not as loud and pronounced as a Merlin, but still equally powerful. When coming from a distance at high speed, you can hear the engine winding up, and it actually is slightly terrifying. A Beautiful looking, and sounding aircraft indeed, but I'll have to see an hear one in person to be wholly satisfied. Re. Adolph Galland's flight in a Buchon: Several decades ago I read a paperback (author forgotten) about the making of the movie, Battle of Britain. From memory only one story stuck out. Galland was seen by the producer and director of the movie as a pain in the "backside" because of his insistence on reality and portraying the LW pilots as humans and not something out of a allied propaganda film. Anyway, he started criticizing the pilots flying the German planes for flying too languidly. The pilots bristled and basically said, "then why don't you show us then?" He did. Afterwards they insisted that one couldn't do that in these planes. Galland replied, "You did or you didn't live very long!" Anyway, I hope I got that right. I suppose Edwards could confirm or deny it. I've been up close to a couple of 109s and what struck me was their small size! Kai-Petri, gtblackwell, George Patton and 2 others like this. I agree, the ME 109 does seem small but most of the competition inline fighters do Still the 109 seems the smallest. When you think they have V 12, 27 liter engines plus fuel and a pilot they seem incredibly small. I did get to ride on the radio shelf behind the pilot of an also small Yak 9, it's Klimov engine having been replaced by an Allison. I an small, 5-6 and 145 il and my head hit the canopy but the flight of my life. Over an hour and lots of acrobatics. I was amazed at how agile it was as were it's rivals. This 9 had about 1400 hp and 5000 pounds ! It is hard to even imagine a dogfight of multiple planes. The owner pilot later told be he was being gently given my age !!! I assume the wings were about to come off doing a loop ! I've had the unique privilege to fly in a T-6 Texan, it was 350$ of my hard earned money, which made it better to be honest. It was incredible, we did acrobatics as well and I came back exhausted, when we probably pulled a maximum of 4 G's for only 2 or 3 seconds, which is nothing compared to combat. Of course the T-6 never got into any dogfights in WW2, but in that moment, I felt that I was in the heat of aerial combat, and it was one of the best 30 minutes of my life. I can't imagine flying in a Yak-9, if you had a hard time fitting Gaines, there is no way I could fit being 6'2 and 195 Ibs!! A 109 with desert camo made passes over us water skiing back in 1982. We stopped and watched in amazement. Following a wing wave, the pilot did a barrel roll on his flyby exit of the air space over the lake. I've done the same since in something with far less performance, scratch the barrel roll. River bottoms are my favorite. Well, the AT-6 did see it's share of combat, but, like you said, just not in WW2. This is the SNJ-4 that I went up in - see attachment. Fairly tame ride around Reading, course, I didn't pay the kind of cash that you did, but this was many years ago. Now, the open cockpit bi-plane I rode in at Old Rhinebeck Airdrome in New York...Not that was a roller coaster without rails. This is the Texan I flew in, Great Pilot named Michael Pfleger, he also races T-6's in Reno every year. That is a beautiful Texan you flew in Takao, I like the ASW paintjob! !